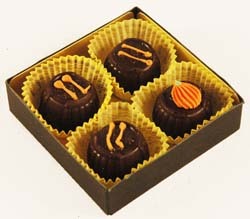 Dorothy's hand-crafted truffles are unparalleled --- and our pumpkin center takes center stage for October and November. These marvels of deliciousness are made with real pumpkin and luscious pumpkin spice, wrapped in Dorothy's marvelous dark chocolate. Each is decorated with a dab of autumn by our chocolate artisans. Hurry. Only available while supplies last!